As a leading German security specialist, Avira has solid experience in the development and support of security solutions. In addition to programs specifically for use on single workstations, Avira primarily offers professional solutions for cross-system protection of networks on various levels. These include products for workstations, file, mail and web servers. Gateway computers can be managed as workstation computers via a central management console for all operating systems. In addition to the management products of the individual solutions, security programs for PDAs, smartphones and embedded devices are also offered. Our clients include renowned national and international corporations, educational institutions and public clients. 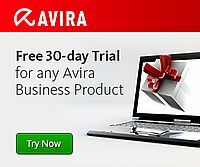 The Avira Endpoint and Email Security is the ideal security solution for businesses with up to 100 computers. In addition to your PCs and servers, it also provides optimum protection for your Email and Internet communication. Avira Endpoint Security brings together the protection of desktop PCs and file servers under Windows and Unix/Linux. This ensures your network is secure against viruses, worms, Trojans, adware, spyware and other malware. Avira Managed Email Security may be the last email protection decision you ever have to make. Just configure it online and place your email security directly in the hands of the experts at Avira. Smart, scalable security enhanced thanks to the introduction of Avira Protection Cloud. The interconnectedness of today’s digital workplace brings unprecedented productivity – and risk. With less on paper and more online, your workstations and notebooks are the engines of your business. Shields your network’s central receiving and distributing points against security breaches. Whether you need to protect a single central file server, or a mix of Windows or Unix servers across multiple sites. The Avira Small Business Security Suite allows you to protect all IT components with award-winning Avira virus protection. There is also an additional spam protection feature. Plus the Avira Management Console for efficient management.